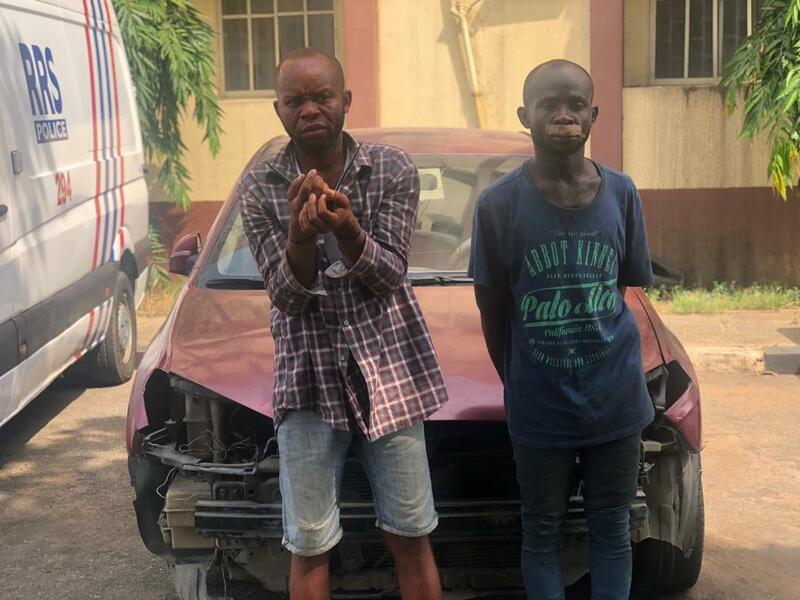 The operatives of Rapid Response Squad (RRS), a unit of the Lagos State Police Command have arrested two suspected robbers for killing an UBER driver and made away with his Hyundai Elantra car with the registration number EPE 676 EC. The new State Police Commissioner,Zubairu Muazu upon information, ordered the Commander of the RRS, Olatunji Disu to the culprits should be fish out the killers so they can face the full wrath of the law . The two suspects, Humble Peter Robert, 33 years old and Gideon Achibong, 36 years old were arrested on Monday, February 4, 2019 around 12.00 pm in Aboki Estate, Lekki area Lagos while removing the car parts for sale to a scrap metal dealer. Investigations by the police revealed that Robert, an ex – convict and a bus conductor in company of three others, now at large, had three days before his arrest conspired to hijack the UBER car. On the said day, the suspects Emma, David, Dolapo and Robert at around 11:00 p.m waved down the deceased, Sunday Obasi in Lekki and told him they were going to Ikate and he charged them N1,000. The suspects before getting to their destination was said to have told the driver that they wanted to ease themselves so the driver parked and It was at this point they descended on the driver and killed him. They were said to have pushed him off the car into the road before driving the car to Beach Road, Lekki, where they hid it for two days while looking for a buyer. Narrating how they operated, one of the suspects, Robert narrated that he sat by the driver’s side. “I was sat in front of the car with the driver. We seized and hit him with stones several times and the driver was injured and he pleaded and even explained that he was sick but we didn’t let him and we pushed him out of his car and went away with the car, a wine colour Hyundai Elantra. 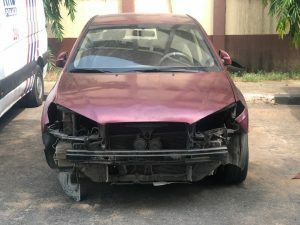 “At the Beach Road, Lekki, where we parked the car, we swapped the number plate of the car with a Volkswagen Passat car (FKJ 708 CA) close by. We left it for two days hoping to contact buyers for the car. “Emma,our leader is also a UBER driver noticed that the driver was operating offline before deciding that we hijack the car from him. The following day when one of us visited where we hijacked the car. He noticed that the driver’s remains has been discovered police. ‘We contacted Archibong to assist us in disposing off the car. The buyers we invited indicated that they can only buy the car parts. It was in the process of dismantling the car that RRS patrol vehicle spotted us and arrested two of us. Emma, Dolapo and David are on the run.” He narrated. Commenting on the development, the Commissioner of Police Zubairu Muazu stated that investigations is ongoing on the case. “The Command will not leave any stone unturned towards ensuring that the fleeing suspect are made to face justice.” He concluded.